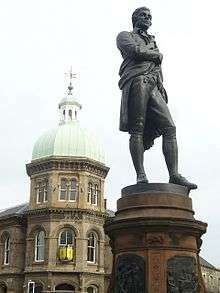 Scottish Canadians have embraced Robert Burns as a kind of patron poet and mark his birthday with festivities. 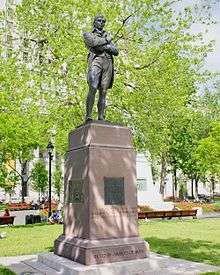 'Robbie Burns Day' is celebrated from Newfoundland and Labrador to Nanaimo. Every year, Canadian newspapers publish biographies of the poet, listings of local events and buffet menus. Universities mark the date in a range of ways: McMaster University library organized a special collection and Simon Fraser University's Centre for Scottish Studies organized a marathon reading of Burns' poetry. Senator Heath Macquarrie quipped of Canada's first Prime Minister that "While the lovable [Robbie] Burns went in for wine, women and song, his fellow Scot, John A. did not chase women and was not musical!" 'Gung Haggis Fat Choy' is a hybrid of Chinese New Year and Robbie Burns Day, celebrated in Vancouver since the late 1990s. 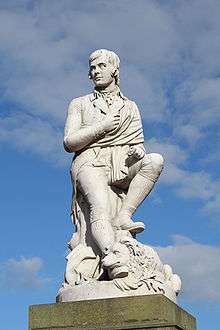 ↑ Including Robbie Burns, Scotland's favourite son, the Ploughman Poet, Robden of Solway Firth and simply the Bard. ↑ "Scotland's National Bard". Robert Burns 2008. Scottish Executive. 25 January 2008. Retrieved 10 June 2009. ↑ "Burnes, William". The Burns Encyclopedia. Retrieved 25 April 2011. 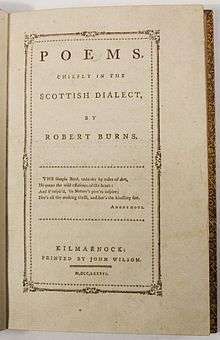 ↑ "Robert Burns 1759 – 1796". The Robert Burns World Federation. Retrieved 25 April 2011. 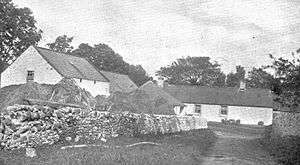 ↑ "Mauchline kirk session records, National Archives of Scotland". 'The Legacy of Robert Burns's feature on the National Archives of Scotland website. National Archives of Scotland. 1 July 2009. Retrieved 21 July 2009. 1 2 3 "Highland Mary (Mary Campbell)". Famous Sons and Daughters of Greenock. Nostalgic Greenock. Archived from the original on 20 February 2010. Retrieved 17 January 2010. ↑ "Feature on The Poet Robert Burns". Robert Burns History. Scotland.org. 13 January 2004. Archived from the original on 27 February 2009. Retrieved 10 June 2009. ↑ "Folkin' For Jamaica: Sly, Robbie and Robert Burns". The Play Ethic. 1 January 2009. Retrieved 10 June 2009. ↑ Rev. Thos. Thomson (1856). Chambers, R, ed. "Significant Scots – Thomas Blacklock". Biographical Dictionary of Eminent Scotsmen. Blackie and Son. Retrieved 17 January 2010. ↑ National Galleries of Scotland. "Artists A-Z − − N − Artists A-Z − Online Collection − Collection − National Galleries of Scotland". ↑ "Diploma of the Royal Company of Archers". Burns' Scotland. Retrieved 3 November 2015. ↑ David Sibbald. 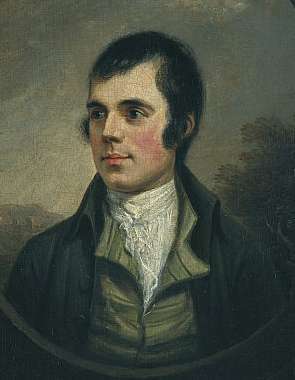 "Robert Burns the Song Writer". ↑ "Folksong Arrangements by Haydn / Folksong Arrangements by Haydn and Beethoven / Projects / Home - Trio van Beethoven". ↑ "Thomson's Select Melodies of Scotland, Ireland and Wales (Thomson, George)". ↑ "25 Schottische Lieder, Op.108 (Beethoven, Ludwig van)". ↑ "12 Schottische Lieder, WoO 156 (Beethoven, Ludwig van)". ↑ Beethoven-Haus Bonn (1 April 2002). "Beethoven-Haus Bonn". 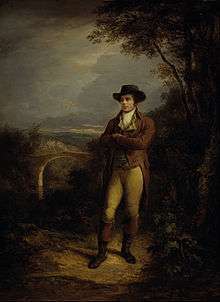 ↑ "MS: 'The Dumfries Volunteers' - Robert Burns Birthplace Museum". 1 2 3 Hogg, PS (2008). Robert Burns. The Patriot Bard. Edinburgh : Mainstream Publishing. ISBN 978-1-84596-412-2. p. 321. 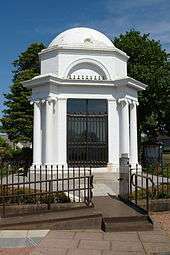 ↑ "Robert Burns Mausoleum". Undiscovered Scotland. Retrieved 2014-08-27. ↑ "Testament Dative and Inventory of Robert Burns, 1796, Dumfries Commissary Court (National Archives of Scotland CC5/6/18, pp. 74–75)". ScotlandsPeople website. National Archives of Scotland. Retrieved 21 July 2009. ↑ "Appointment of judicial factor for Robert Burns's children, Court of Session records (National Archives of Scotland CS97/101/15), 1798–1801". 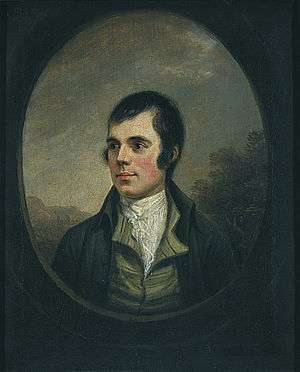 'The Legacy of Robert Burns' feature on the National Archives of Scotland website. National Archives of Scotland. 1 July 2009. Retrieved 21 July 2009. ↑ Hogg, PS (2008). Robert Burns. The Patriot Bard. Edinburgh : Mainstream Publishing. ISBN 978-1-84596-412-2. p. 154. ↑ "Burness Genealogy and Family History - Person Page". ↑ Rumens, C (16 January 2009). "The Bard, By Robert Crawford". Books. London: The Independent. Retrieved 10 June 2009. ↑ Watson, J (7 June 2009). "Bard in the hand: Trust accused of hiding Burns's mental illness". Scotland on Sunday. Retrieved 10 June 2009. ↑ "'Burness, Edwina (1986) "The Influence of Burns and Fergusson on the War Poetry of Robert Service," Studies in Scottish Literature:Vol. 21: Iss. 1.'". Retrieved 27 January 2013. ↑ "'Haggis stress'". The Western Start. 25 January 2013. Retrieved 27 January 2013. 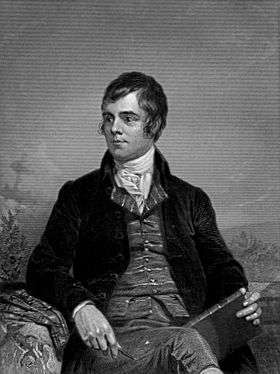 ↑ "Robbie Burns' life celebrated with poetry and music". Nanaimo Bulletin. 25 January 2013. Retrieved 27 January 2013. ↑ "Ian Hunter: Robbie Burns was the everyman's poet". National Post. 25 January 2013. Retrieved 27 January 2013. ↑ "Regina weekend round up: Robbie Burns Day". Metro News.ca (Regina). 25 January 2013. Retrieved 27 January 2013. ↑ "Robbie Burns buffet menu". Canadian Living. 25 January 2013. Retrieved 27 January 2013. ↑ "Happy Robbie Burns Day from the 'Bard' Himself!". McMaster University Library. 24 January 2013. Retrieved 27 January 2013. ↑ "Fans of Robbie Burns' poetry at SFU attempt to break their own world record". Global TV (BC). 25 January 2013. Retrieved 27 January 2013. ↑ "Ceremonies & Events: Robbie Burns Day". Simon Fraser University. January 2013. Retrieved 27 January 2013. ↑ "In Sir John A. 's Footsteps: The Virtual Tour". City of Kingston (Ontario). n.d. Retrieved 27 January 2013. ↑ "Gung HAGGIS Fat Choy: Toddish McWong's Misadventures in Multiculturalism". Retrieved 27 January 2013. ↑ "What do you get when you fuse Robbie Burns to Chinese Canadians?". Ugly Chinese Canadian.com. 17 January 2013. Retrieved 27 January 2013. ↑ Crawford, Robert. "The Abraham Lincoln Papers at the Library of Congress." Robert Crawford to Abraham Lincoln, Saturday, January 23, 1864 (Invitation to attend Robert Burns celebration). 23 January 1864. http://memory.loc.gov/ammem/malquery.html (accessed 20 January 2013). Lincoln's toast: see Collected Works, VIII, 237. ↑ Simpson, R (5 October 2008). "Bob Dylan names Scottish poet Robert Burns as his biggest inspiration". London: Daily Mail. Retrieved 13 July 2009. Bob Dylan has named his own greatest inspiration as the Scottish poet Robert Burns. The American singer-songwriter was asked to say which lyric or verse has had the biggest effect on his life. 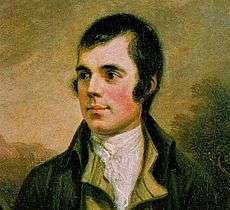 He selected the 1794 song "A Red, Red Rose", which is often published as a poem, penned by the man regarded as Scotland's national poet. ↑ Michaels, S (6 October 2008). "Bob Dylan: Robert Burns is my biggest inspiration". London: The Guardian. Retrieved 11 June 2009. Dylan has revealed his greatest inspiration is Scotland's favourite son, the Bard of Ayrshire, the 18th-century poet known to most as Rabbie Burns. Dylan selected A Red, Red Rose, written by Burns in 1794. ↑ "J. D. Salinger's Catcher in the Rye". Sparknotes. Retrieved 14 July 2010. When [Holden] tries to explain why he hates school, she accuses him of not liking anything. He tells her his fantasy of being "the catcher in the rye," a person who catches little children as they are about to fall off of a cliff. Phoebe tells him that he has misremembered the poem that he took the image from: Robert Burns's poem says "if a body meet a body, coming through the rye," not "catch a body." ↑ "Burns Biography". Standrews.com. 27 January 1990. Archived from the original on 11 December 2004. Retrieved 10 June 2009. ↑ Trew, J (10 April 2005). "From Rabbie with love". Scotsman.com Heritage & Culture. Retrieved 10 June 2009. 1 2 "Congratulation Greenock Burns Club". The Robert Burns World Federation Limited. Retrieved 18 January 2010. ↑ "Posthumous recognition of Burns, the land surveyor". RICS. 19 November 2012. Retrieved 21 November 2012. 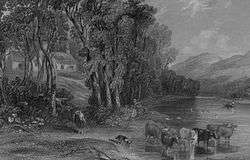 ↑ "Robbie Burns Day: 10 facts you never knew". Simcoe. 21 January 2015. ↑ "Camperdown's Robert Burns Festival". Victorian Government. Retrieved 12 June 2015. 1 2 "Clydesdale launches Homecoming bank notes". The Herald. 14 January 2009. ↑ "Current Banknotes : Bank of Scotland". The Committee of Scottish Clearing Bankers. Retrieved 17 October 2008. ↑ "The 2009 Robert Burns £2 Coin Pack". Archived from the original on 18 December 2008. Retrieved 5 January 2009. ↑ "THE SONGS OF ROBERT BURNS from the Scots Musical Museum". Jean Redpath Sings. Retrieved 11 January 2014. ↑ "Clarinda – The Musical – No woman shunned Robert Burns' advances, until he met Clarinda!". Clarindathemusical.com. Retrieved 10 June 2009. ↑ "Clarinda – The Musical – United States Premiere!". abettheatre.com. Retrieved 15 December 2012. ↑ "Our Own Robbie Burns (Tucker, Henry L.)". ↑ Robert Burns voted Greatest Scot STV. Retrieved 10 December 2010.